“Mommy, Daddy, where do trees come from?” Whew! At last, a simple question. The Clones are Already Here! Whew! At last, a simple question. Since all trees are what scientists call “seed plants”, the obvious answer is – a seed. Well, that’s mostly true, but there are some interesting twists and turns along the way. Trees in Tryon Creek State Natural Area produce unfathomably large amounts of seed. Last September a bigleaf maple (Acer macrophyllum) tree at Tryon Creek crashed to the ground during a rain storm. From this tree, I sampled the single branch shown in the photo below. It’s a mighty big branch! Considering the entire Tryon Creek forest, this one branch is insignificant. And yet, when I stripped off all the seeds that it had produced that year, there were 1,024 seeds on this single branch. 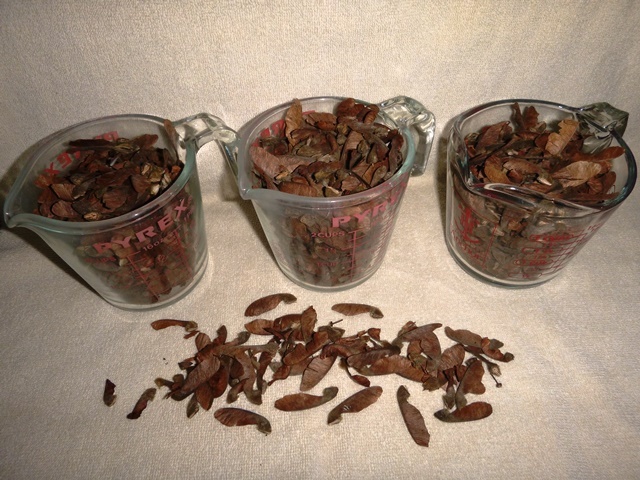 As you can see in the photo below, that’s more than 1-1/2 quarts of maple seeds! More than enough seeds to completely reforest an entire acre, a square of land more than 200 feet by 200 feet in size. 1,024 big leaf maple seeds! It took a while to count this bunch! In spite of this prolific seed production, there are many maples at Tryon Creek which did not start directly from a seed! Maple trees have a tendency to produce small branches, called sprouts, near the base of the tree trunk. One example is shown in the photo below. When a mature maple is cut down, or if the top breaks off in a storm, this basal sprouting kicks into high gear! 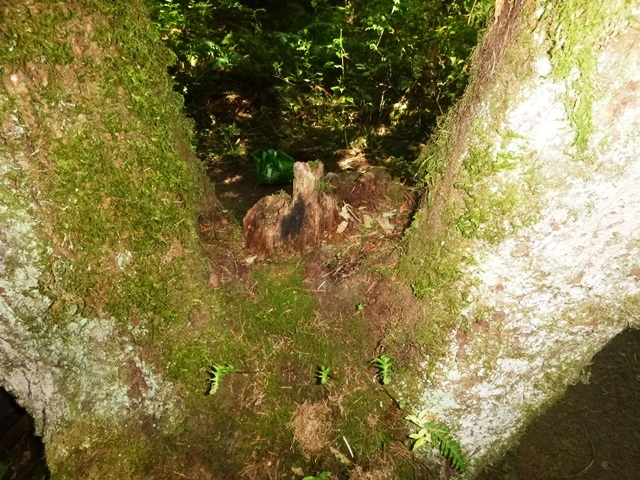 Occasionally in the forest, you will see a tight cluster of maple trees growing from a single spot. You might suspect that several seeds landed close together, germinated and formed this cluster of trees. For example, with this pair of maples below. However, at least sometimes it is obvious that the trees are all clustered around the remnants of a long dead tree. 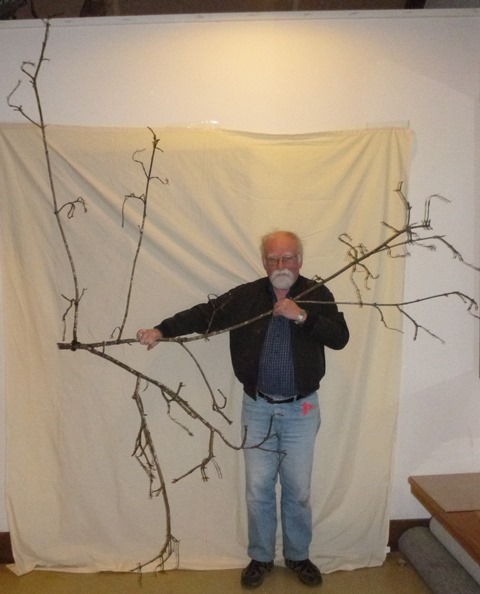 In the case of these “twin” maples, the remnants of the old parent tree, as seen in the picture below, are reduced to a mere stub of dead wood sticking up in the crotch between the two stems. Thus what might appear to be multiple maple trees are really just multiple mature sprouts from one “parent” tree. The sprouts grow quickly using both the food stored in the parent tree roots, and the established network of roots. 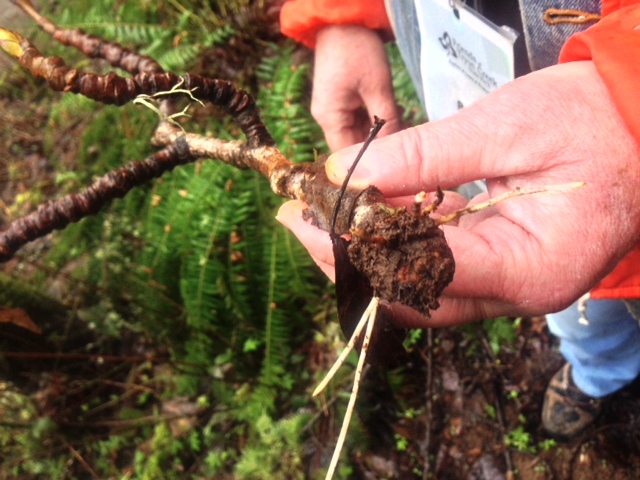 This sprouting habit helps the forest recover quickly from disturbance. Another tree which sometimes reproduces itself without using seed is Tryon Creek’s black cottonwood (Populus balsamifera ssp.trichocarpa). Black cottonwood clones itself in a very dramatic fashion. If a branch breaks off a tree, and falls onto moist ground, a new tree can start from that branch. Jennifer Primm, Tryon Creek’s newest Ranger, and I found the example in the photo below while hiking on Old Main Trail this spring. Note that it has all the essentials for a young tree – buds, branches and, of course, several white roots. This youngster had the buds and stems when it broke off the parent tree. The roots, however, developed after it fell to the moist ground. Once it hit the ground, at the point where the branch broke off, cells within the stem started to grow, divide and expand. Had the branch remained on the tree, these cells would have produced wood and bark for the twig. However, under these new circumstances they developed into a blob of poorly organized (scientists say “undifferentiated”) cells called a callus. We can see the callus in the photo below. The surface of a callus tends to be a bit lumpy and irregular. What you see here is not just dirt stuck to the end of the stem. It is plant tissue. If this callus had been developed in a laboratory, it would be pure white, but here the callus has probably been stained brown by the soil. After the callus forms, some of the cells within the callus start to differentiate and get organized. 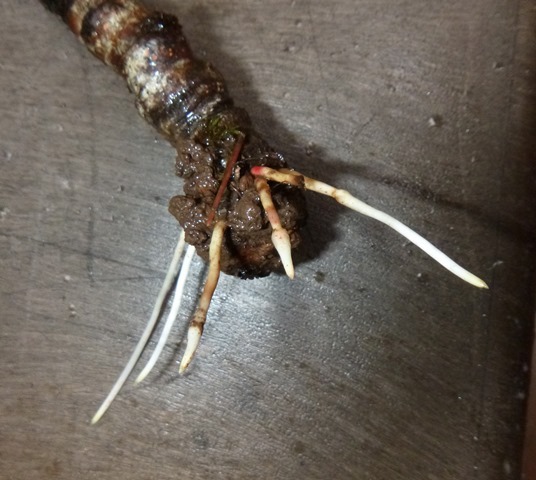 Depending upon the environment of the callus, and it’s location on the plant, these cells might become roots, leaves or some other plant part. 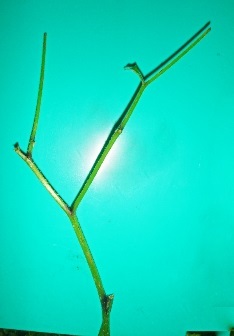 Here, growing at the base of a twig, the callus typically develops roots. This new plant, of course, will be genetically identical to the parent tree, in other words, a clone of the parent. This ability of cottonwoods to root from a piece of stem has important commercial applications. Many years ago I worked as a Research Forester. Then I was involved in developing and testing techniques for establishing cottonwood plantations. The company I worked for set up some of the first cottonwood plantations in the lower Columbia River bottomlands, and irrigated plantations near Boardman, in eastern Oregon. All of the trees in these plantations were established using “cuttings” which were 1 foot long pieces of cottonwood branches anywhere from ½ to 1 full inch in diameter. The cuttings were taken in the winter, and planted in early spring. Nearly all the cuttings rooted and created new trees. The success of these early test plantations resulted in the extensive commercial cottonwood plantations that you see today in those two areas. 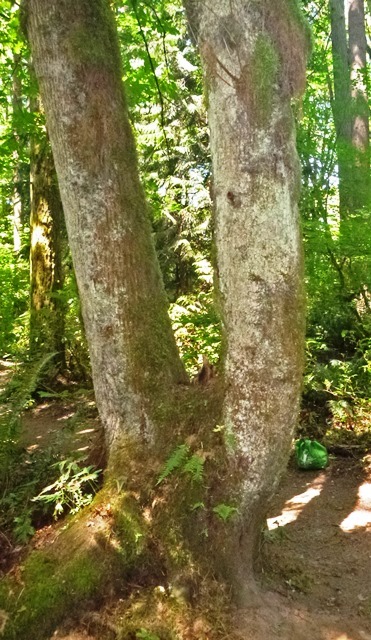 So while vegetatively produced trees are the exception, they provide an interesting aspect of tree life at Tryon Creek. While all the trees at Tryon Creek SNA may have originally come from a seed, a few of them have some odd twists in their family tree (I couldn’t resist!) 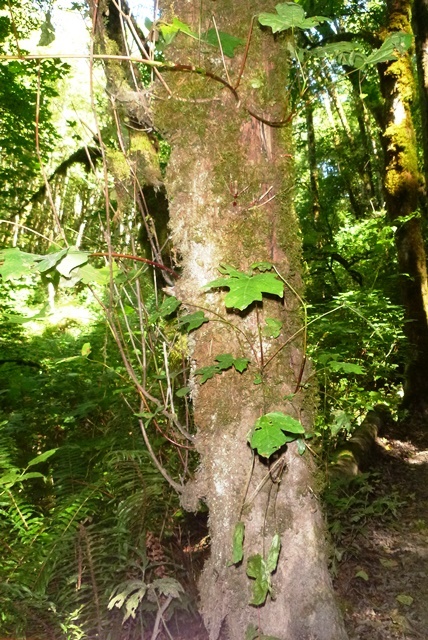 The next time you’re at Tryon Creek, see how many maple trunks growing in a clump you can find. When it comes to atmospheric phenomena like temperature and precipitation, climate, the long range view, has been hogging the spotlight recently. Hardly a week goes by without some new commentary on climate change. However, the June 16th hailstorm at Tryon Creek State Natural Area was a rude reminder that just 15 minutes of wild weather can make a huge impact! Plants took the brunt of the blow. Being rooted in one place, plants can’t scurry for shelter until the storm passes over. A quick survey of Tryon Creek SNA’s plant life right after the storm demonstrated how devastating it was. Different plants showed different levels and kinds of injury. 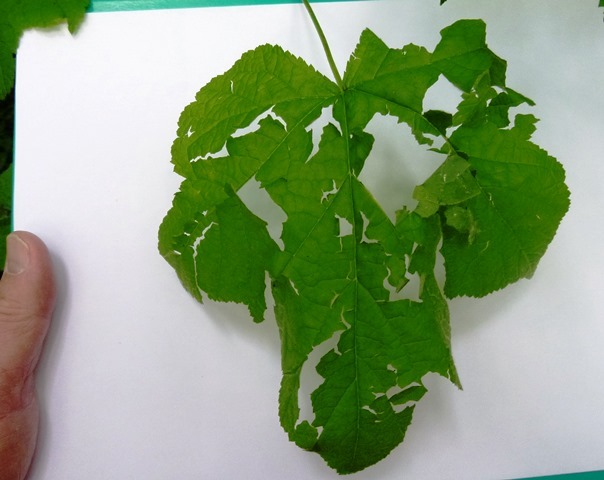 The extent of hail damage appeared to depend upon two factors – exposure and the physical nature of the plant itself. 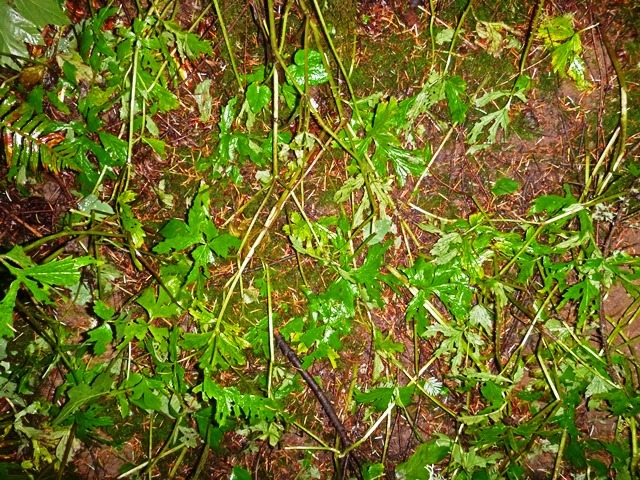 These two factors combined to generally produce little damage to, for instance, vine maple (Acer circinatum) and salmon berry (Rubus spectabilis). On the other end of the spectrum, it was a bad day to be a Pacific waterleaf (Hydrophyllum tenuipes) or a jewelweed (Impatiens capensis). Let’s look at the different types of damage to the plants, and consider some of the possible consequences. Level 1: That’s Not Nice! Damage – In the first level of damage, I place shredded leaves. These leaves stayed on the plant, but had significant chunks knocked out of them by the hail stones. Pictured below are examples of a thimbleberry (Rubus parviflorus) leaf and a trillium (Trillium ovatum) leaf. Possible Impacts – The main role of the leaf is to convert sunlight, carbon dioxide and water into sugar. This sugar is used to support the plant’s growth and development. At the time of the hailstorm, the leaves had already been making sugar for a couple of months, a lot of which was used for this year’s growth. By this point, however, at least some of the sugar has been stored in the perennial plant parts (like roots or woody stems) to kick-start next year’s growth. Clearly some sugar making capacity was lost for the rest of this season, but was it enough to make a difference? Only time will tell. And truth be told, not all the leaves were shredded to the extent shown above. Level 2: Hey, that Hurts! Damage – In the second level of damage, I’ve placed plants that have had leaves or fruits completely knocked off the plant. One plant that was heavily damaged in certain areas was the Indian-plum (Oemleria cerasiformis). 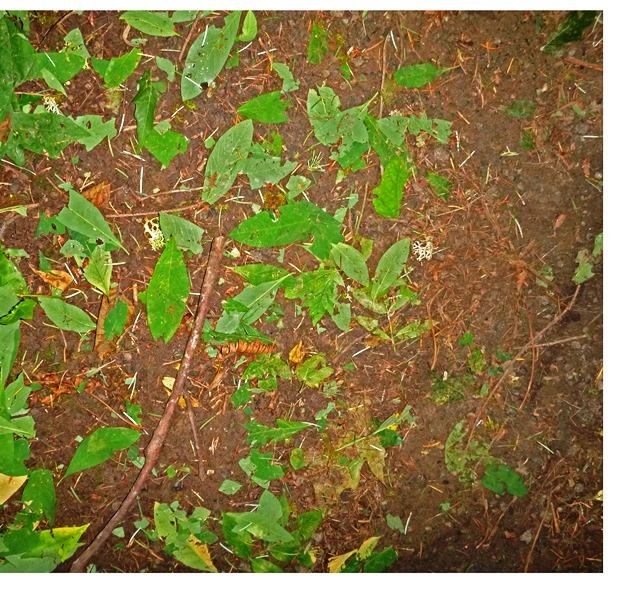 In the photo below, nearly all the leaves you see on the ground are Indian-plum. Taking a different perspective, the photo below is a Pacific waterleaf plant (I think you’re going to have to take my word on that!) that has been completely stripped of leaves. An especially interesting case of plant parts being knocked off was the low Oregon grape (Mahonia nervosa). This species had maturing fruits at the time of the hailstorm. Many to all of the fruits were knocked off, as you can see in the two photos below. Lest you think they were just eaten up, I found numerous semi-ripe fruits on the ground under these plants. 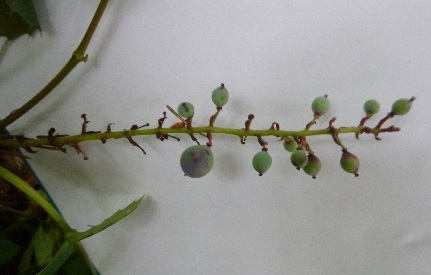 The photo below shows a fruit stalk with most of the fruits knocked off, and only the small stems showing where they were. Here is a shot of low Oregon grape with all the fruits knocked off this stalk. 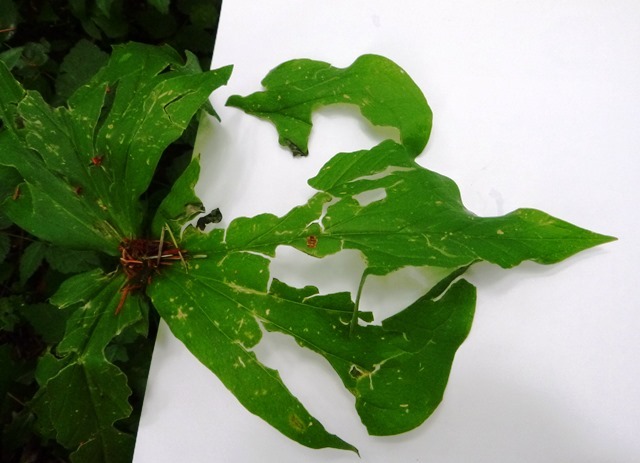 Possible Impacts – Again, the loss of leaves reduces the photosynthetic ability of the plants. The different species may react differently to this. Indian-plum is a plant that develops and matures very early in the year. In fact, there were already yellow leaves visible on many of the Indian-plum shrubs prior to the storm. If it is already starting to lose its leaves, that may be a signal that the plant is already past its peak. The loss of leaves to the mid-June hailstorm may not be a big deal. The loss of the low Oregon grape’s not-quite-ripe fruits may or may not be a problem. In reality, the low Oregon grape is a perennial plant. For perennials, producing no seeds in a given year is not a life-and-death issue. Also, if the seeds were already “ripe enough” when knocked off the plant the hail storm is no big deal. In contrast to low Oregon grape, the seeds of the Indian-plum had already ripened and dispersed before the storm. For Indian-plum seeds, the hail storm was a non-event. 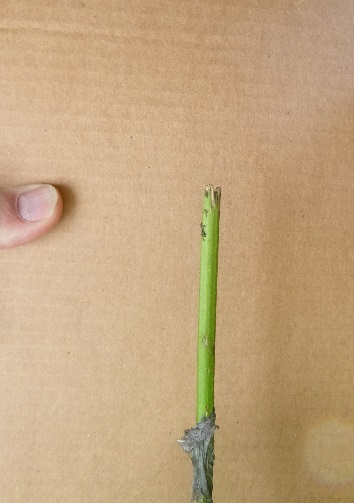 Damage – In this category are plants with the tip of the stem knocked off. Examples are the red elderberry (Sambucus racemosa) below, and the jewelweed next. Possible Impacts – One of the reasons plants grow tall is to outcompete neighboring plants in the race to get sunlight. When the top of a plant is destroyed, it is at a clear disadvantage to its taller neighbors. These damaged plants, assuming their neighbors are unharmed, will now literally be in the shadows of their competitors. For the jewelweed, there is another HUGE potential problem. Jewelweed is an annual plant, which means that each year the plants have to grow up from seed. Customarily, the jewelweed flowers are produced near the very top of the plant. That top is now gone. As far as annuals producing seeds every year goes, it would seem that failure is not an option. The peak of jewelweed flowering is August and early September. Thus it appears at first blush there might be no seeds available in the spring of 2015. However, two special circumstances suggest that all is not lost. Like many plants, the seed of jewelweed can remain viable in the soil for more than one year. 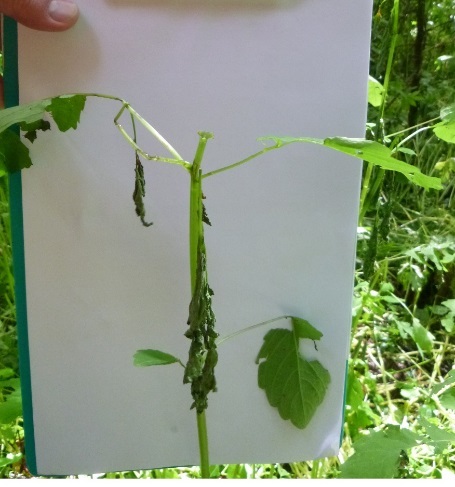 A scientific study of our jewelweed in the Czech Republic (where it is an invasive species) indicates viable seed can persist in the soil for up to three years. So maybe plants coming up in 2015 could be from seeds produced in 2013, or even 2012! Another mitigating factor is that jewelweed has two kinds of flowers. One kind that are pollinated by bees, and a second kind which pollinate themselves. The self-pollinating flowers are called cleistogamous. (Why does there always have to be a big word?) The jewelweed’s cleistogamous flowers are produced early in the season. They pollinate themselves without even opening, and produce seed. This year I saw the first immature jewelweed seed pod on June 1st. I found several ripe seed pods on June 11th, five days before the storm. Since I also saw the first “regular” flower on June 11th, I assume the early June seedpods were from cleistogamous flowers. So hailstorm schmailstorm, there might still be viable jewelweed seeds in the soil come 2015! Damage – In this ultimate damage category are the plants that were flattened to the ground by the hailstorm. There were places where it looked like an elephant had rolled on the ground. The two primary species that were flattened were Pacific waterleaf and jewelweed. Both of these are herbaceous plants with delicate stems. Below is a picture of a flattened patch of Pacific waterleaf. Possible Impacts – If the stems were damaged during the flattening process, the entire above ground portion of the plant is lost for the year. Alternatively, perhaps the leaves will just lie on the ground, and continue photosynthesizing in that position. The seeds of the Pacific waterleaf were almost full size, but still not mature based on monitoring 6 days before the storm. However, as a perennial, the waterleaf has probably already stored at least some carbohydrate in the underground rhizomes and these rhizomes, not the seeds, hold the immediate future of the plant. In the short run this hailstorm damage looks bad. But the resiliency of plants is legendary. I’ll be following the damaged plants for you, and later this summer I’ll report on how the recovery, if any, is progressing. I know the plants have one or two tricks up their sleeves, and in a little while, we’ll all know which ones they’ll use to survive.